Yikes!!... Nearly two years since my last post. Well, i haven't had too much time for electronics since i went back to work as a cook. Selling my custom instruments for three years didn't really pan out, and i was forced to rejoin the wage-earners. Not really a bad thing, though. It is nice to be around people again. Especially cooks. They(we) are the best(worst) kind of people you will ever meet. About a year ago, before i found out i was going to be a daddy, work in the kitchen was slowing down. My boss was having trouble finding hours for me, so i was only working about two days per week, which was fine with me at the time. I had more time for electronics. In fact, a lot of time. I had so much time i decided to come up with a new NT model, and really try to do it right so that i could make a lot of them. Coming up with the circuit was one thing, but i wanted these new noise-makers to be clean and organized. I also wanted to be able to fit as much as possible into them. 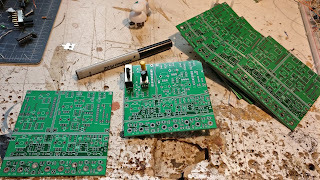 So i sat down and learned how to design my own printed circuit boards(PCB's) with some really great, free software, KiCAD. I highly recommend this software if you aren't already using something else. It is very easy to learn, and very easy to draw your own parts, which can be very useful. 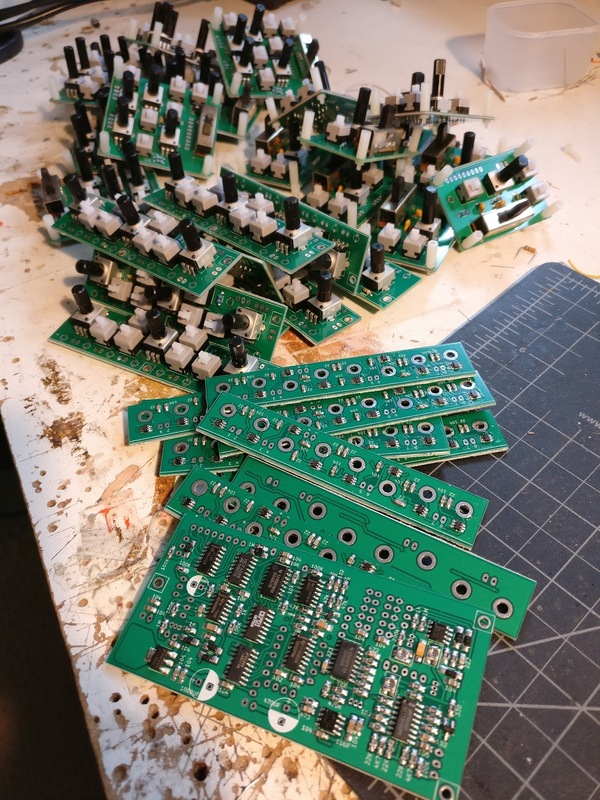 So as long as i am designing my own PCB's why not go surface mount? Hell yes! I made a small investment in surface mount parts from ebay. This is really the way to go. The parts are insanely cheap, and very easy to store and keep organized. 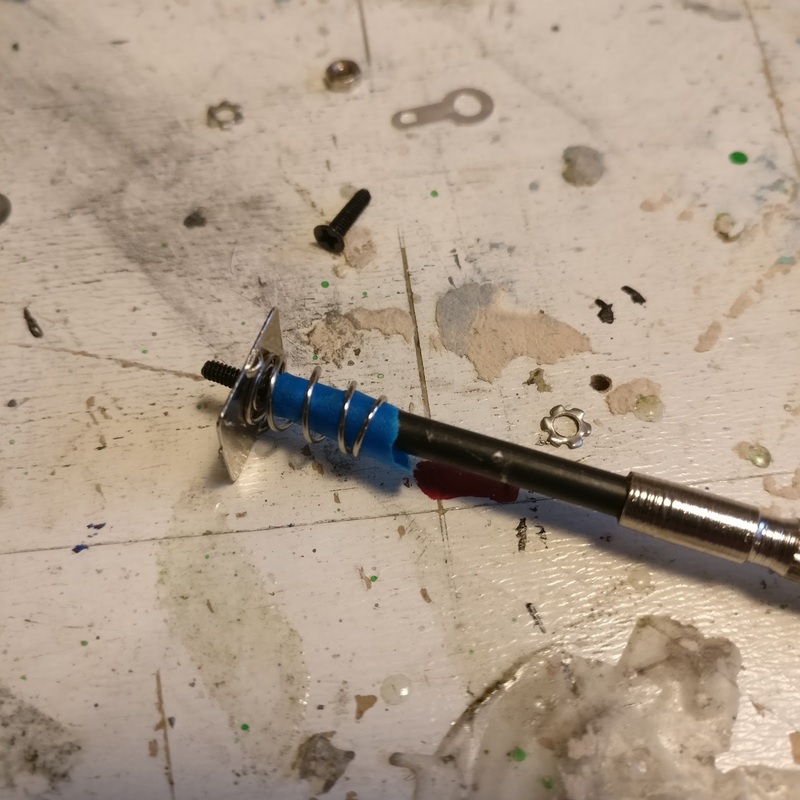 No more piles of cut-off component leads all over the place. Once i was confident with my first PCB designs, i sent them off to be made in china by Seeedstudio. 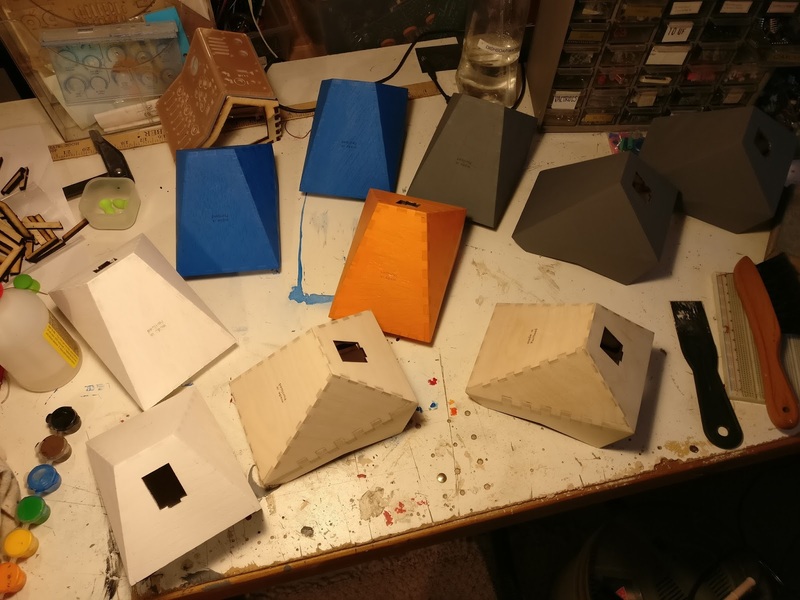 They are super cheap, and the quality is very nice for the scale i am working at. The only catch is the shipping cost, but at least shipping is fast, and they track, so it's worth it in the end. It can really add up though when your design has mistakes and you have to keep reordering several times like i did, but i guess that is just the price you pay for this kind of thing. In fact, it would have been a miracle if it was perfect the first time, and i knew that going in. So, the plan was to come up with a super slick project file for the NT04 so that i could build them easily, even if years had gone by. I generally try to take good notes on all of my projects, and update them as i go, but it is sometimes hard to know what is important information for the future when you are immersed in the moment. So i would keep an inventory list of all of the components needed and have all files and diagrams updated and organized... Yeah right, still working on that. Work picked back up in the kitchen, and i had to put the NT04 on hold for a whole year. I had nearly assembled six by the time i put the project on hold. They just needed main boards and wiring. 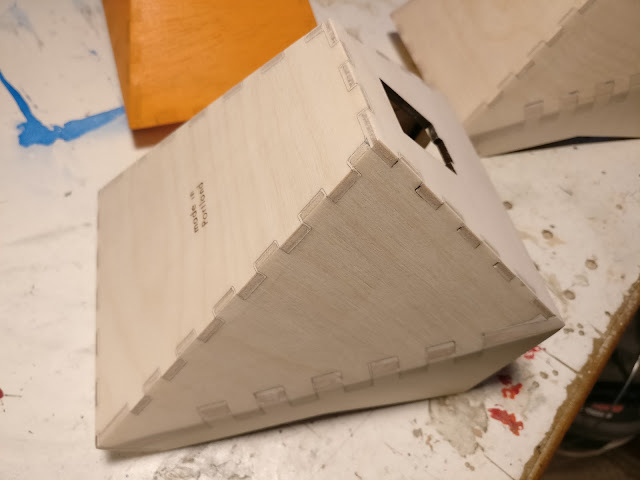 Thankfully i had successfully built one working unit before the hiatus, so at least i knew the design worked. Fast forward to now, i am only working two days per week again, but i am a Mr. Mom now. 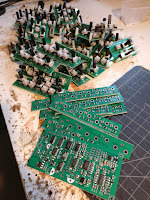 There is still not much time for electronics, but there has been enough time to finish the six NT04's i started. Ok, so what's inside the NT04? The NT04 is a programmable 8-step sequencer with 8 touch sensors, and one tuning knob. When you touch a sensor, the sequencer will jump to that step, and the step will be held as long as you are touching it. When you let go of the sensor, the sequencer will continue from that point. The sequencer can also be turned off with the run switch(run), and the touch sensors can be used like a keyboard. When the record button(rec) is on, and a touch sensor is pressed, that sensor's respective step will record the setting of the pitch knob(ptch). Each step has its own LED indicator. The sequencer can run in either direction depending on the up-down switch(u d). If the sequencer is in down mode, reverse mode(rvrs) can be enabled. Reverse mode is simply another clock signal that toggles the sequencer between up and down mode. The rate of the reverse clock can be set with the "rvrs" knob. Both the sequencer rate and pitch setting can be controlled with the Y axis of the joystick when each's respective "joy" switch is toggled. The sequencer clock rate can be modulated with the sequencer's recorded steps. 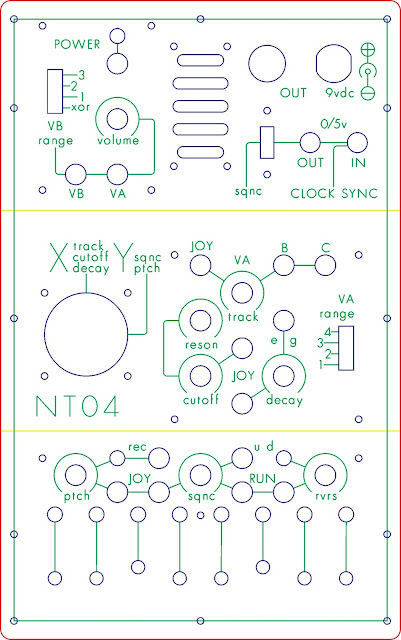 The "sqnc" switch sends the CV sequence to the sequencer clock VCO for some weird swinging rhythms. The sequencer modulates a pretty basic square-wave VCO (VB). 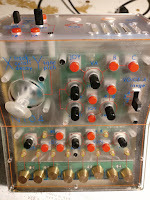 VB has four modes; normal(3), -1 octave(2), -2 octaves(1), and XOR. XOR is kind of like a ring modulator but for square waves. VB is the carrier, and VA is the modulator(or vice-versa). VA is PLL VCO that tracks the frequency of VB. 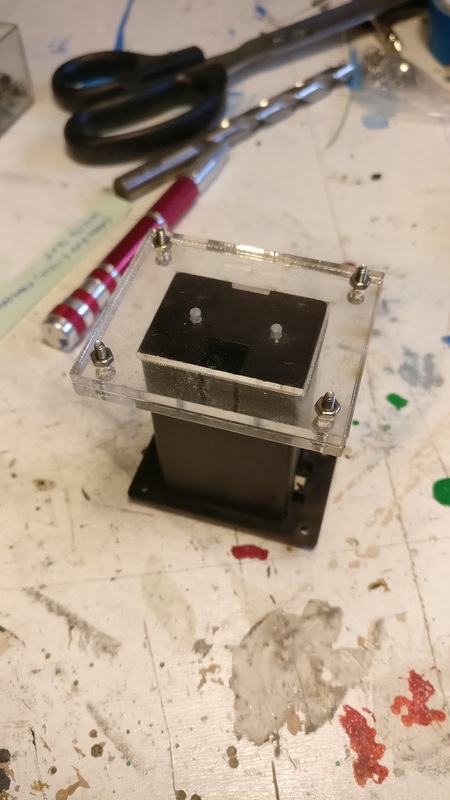 The tracking filter of the PLL is intentionally designed to be inefficient for its wild phasing, chirps, buzzes and other strange but consistent anomalies. The VA track knob adjusts the tracking filter from jittery-fast to portamento-slow. 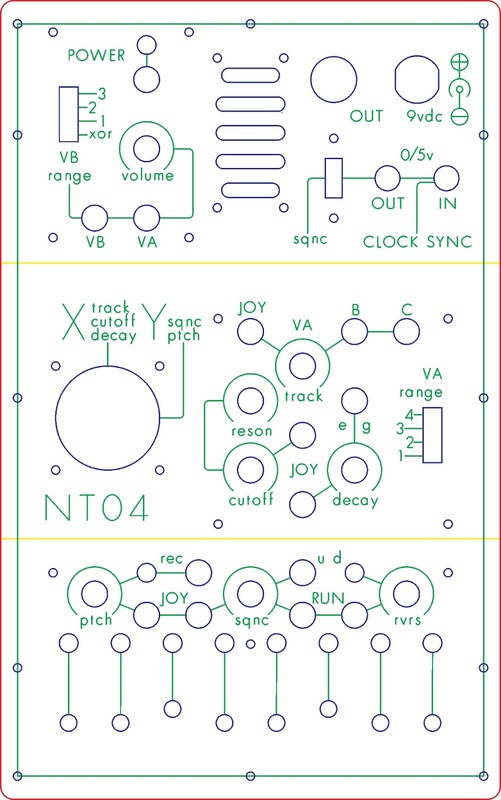 The VA tracking filter also has two additional filter modes, "B" and "C", which are really just different sized filter capacitors for more crazy ranges for the PLL VCO. If that wasn't enough, the PLL VCO also has four octave ranges that can be set with the VA "range" switch. VA-4 is matched with VB-3, and VA 3-1 are all octaves up. The VA tracking filter can be modulated by the X axis of the joystick when its "joy" switch is toggled. Both VA and VB are mixed together with simple on/off switches (VA and VB) before being sent to a 12db lowpass VCF. The VCF has a cutoff knob and a resonance knob. The cutoff can be modulated by the X axis of the joystick if its "joy" switch is toggled. The VCF can also be modulated by a simple envelope generator. The envelope generator has an on/off switch and a decay knob. The depth of the EG is set to mid range, so the initial cutoff setting sets the overall range. When the sequencer is disengaged, the EG can be triggered by the touch sensors. 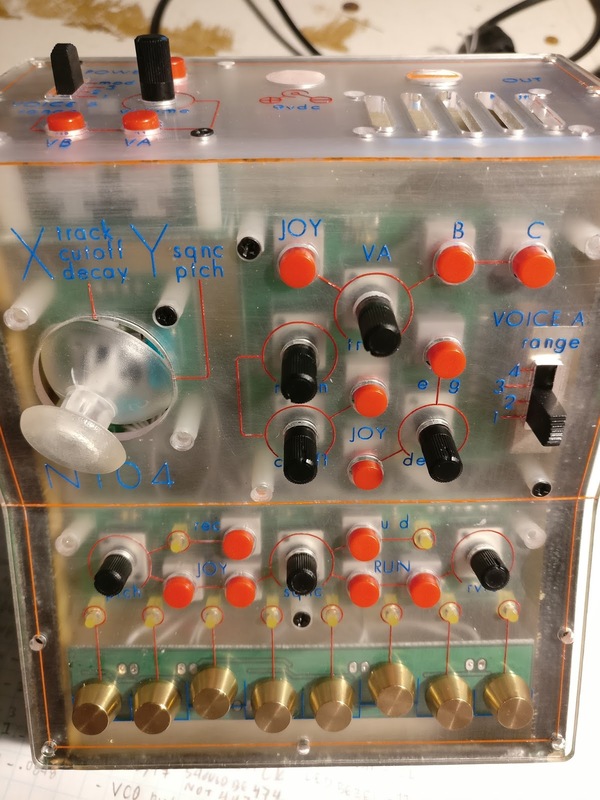 The decay of the envelope generator can be modulated by the X axis of the joystick if its "joy" switch is toggled. 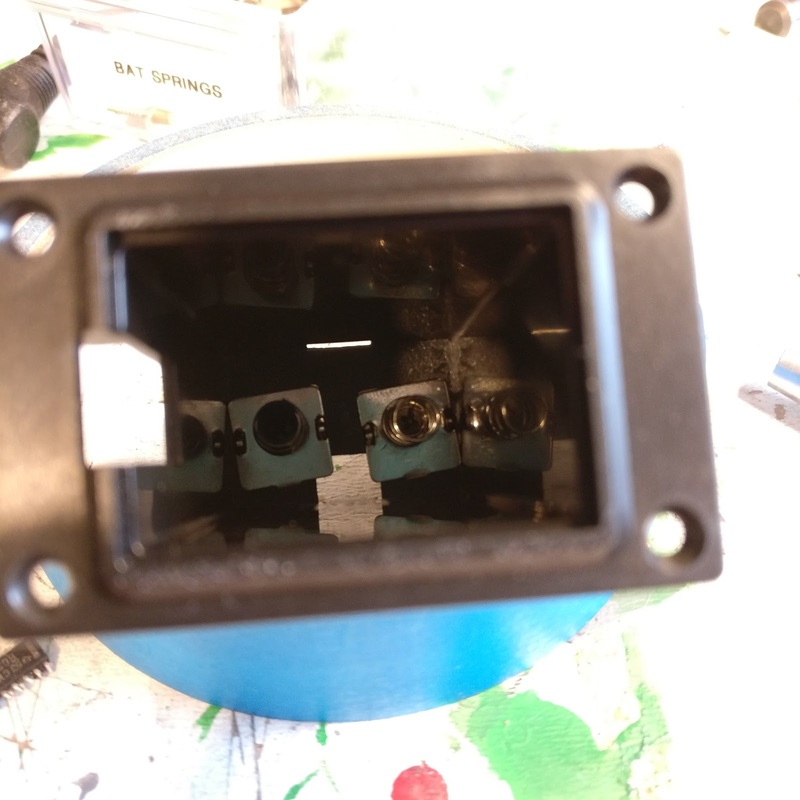 After the filter stage, the signal is sent through a volume control knob, and out to the speaker or 1/4 inch line out. The NT04 can be powered with a 9 volt battery or a standard 9 volt adapter. Additionally, there are two clock sync jacks. One is input, the other is output. The output will send either clock signals or trigger signals, depending on whether sequencer is in "run" mode or not. Any signal coming to the input will advance the sequencer whether the sequencer is in "run" mode or not, the only difference is that when in run mode, the input signal can trigger the EG. Any signal input will be sent to the unit's output, so syncing multiple units in series is possible. Wow, what a mouth full! Here is a quick video that covers some basic functionality and sync-ing options. 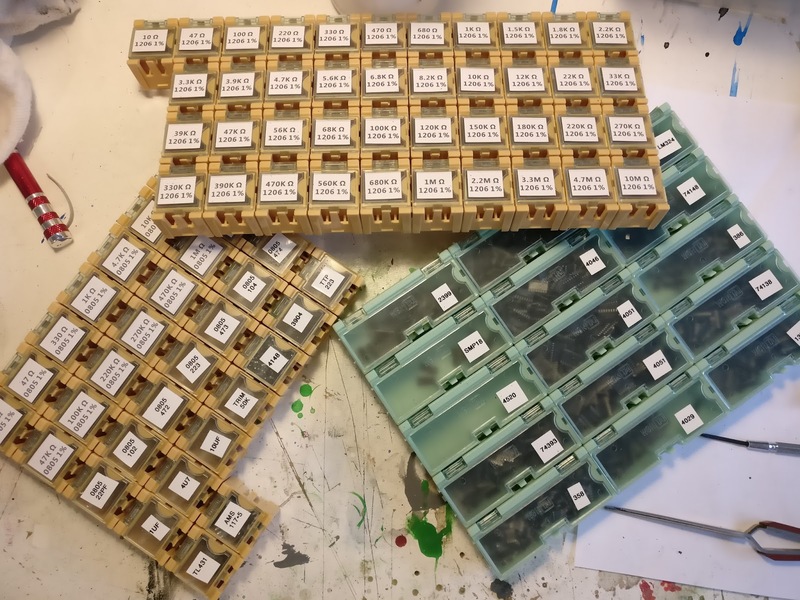 These plastic 9 volt battery compartments can be pretty useful. 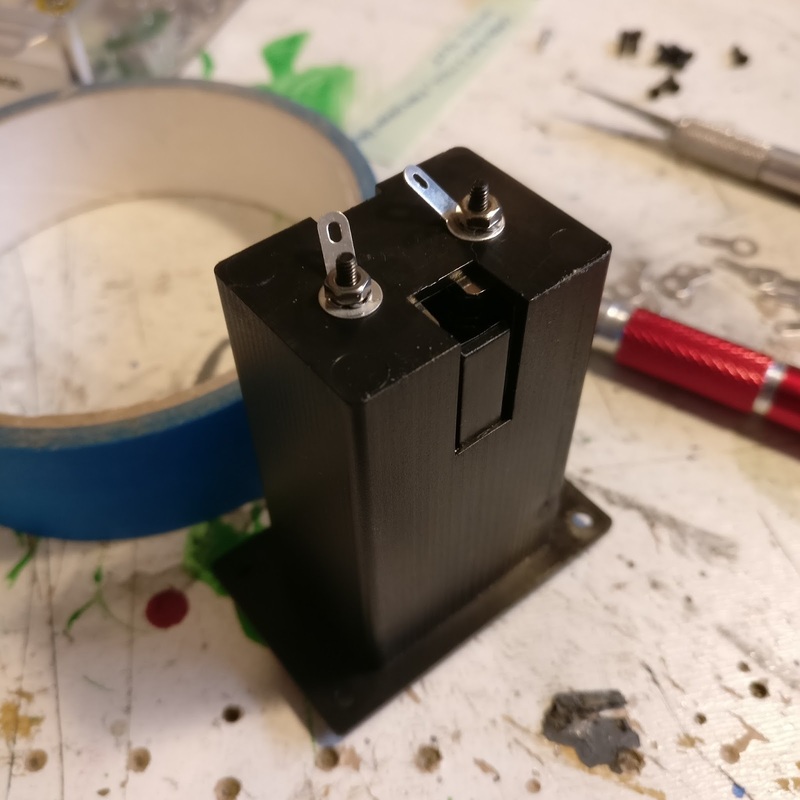 Unfortunately they do not come with terminals, and using wire-lead snap-connectors makes changing the battery a pain, so installing terminals is a must. First i created a drill hole guide for the terminals. 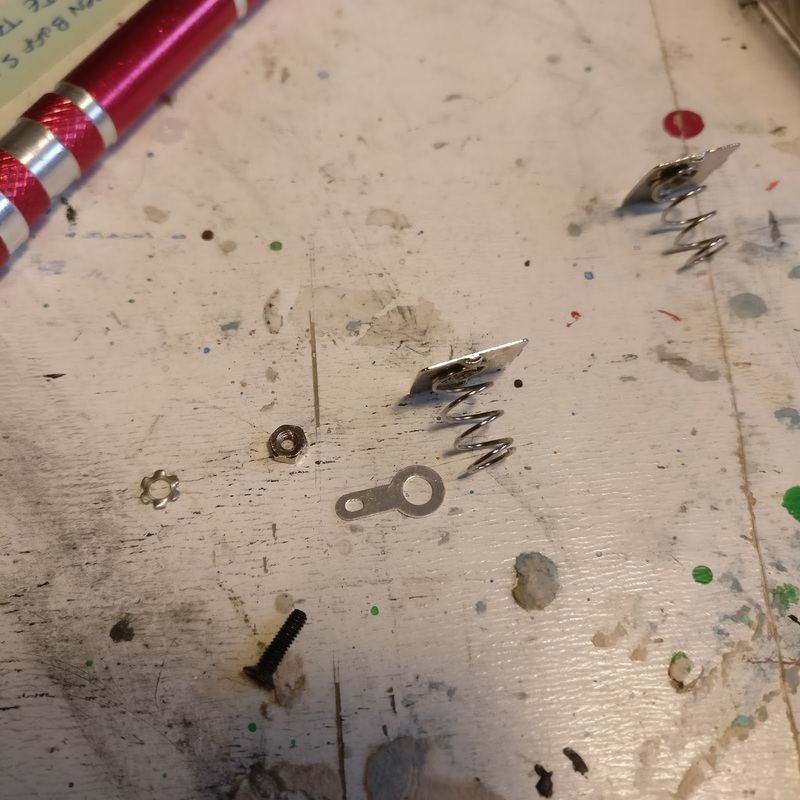 Then using battery terminal springs, m2 screws, m2 lock washers, m2 nuts and solder tab eyelets(all found on ebay), bolted the terminals to the bottom of the battery compartment. Lining up the screw through the spring and into the hole inside the compartment was tricky, but i found the best solution was to use a little piece of tape to wrap the screw and screwdriver together, and then push the screw through. More effort, but saved time in the long run.